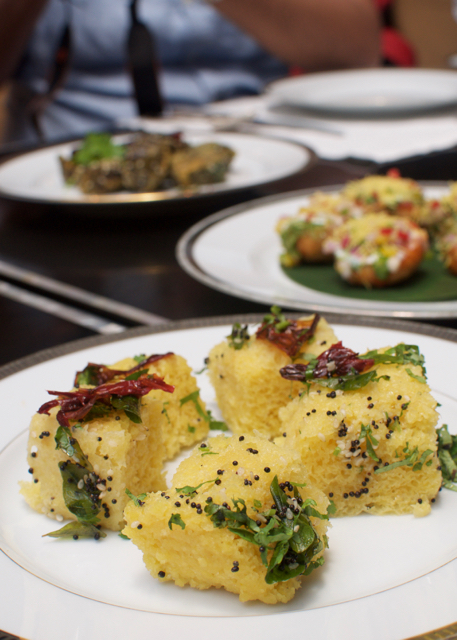 Gujju meals are veg, Gujju meals have sugar in sambar, Gujju meals have sugar in everything, and many more myths were busted at the Gujarati Rasoi happening at Jamavar, Leela Palace. But before I start off about the food, the ambiance deserves more than a mention. Uber luxurious. 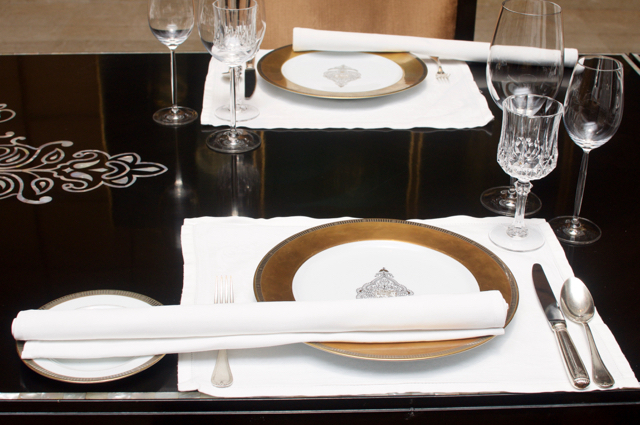 With exquisite cutlery and grandiose decor, Jamavar is a luxury showcase of the Fine Dining Indian restaurant to its largely foreign diners. The fact that it was nearly packed on a week night definitely says a few things about it. In a place like this, a-la-carte is generally a bad option, unless you are really small eater or here to experience the luxury on a budget. A chef's meal is probably the way to go and I was glad that the food festival was also a set meal. Being hosted for dinner with a vegetarian has it's benefits! We got to try lots of the wonderful vegetarian stuff. If it's two of you, I'd definitely recommend ordering one veg set menu, and both veg and non veg are priced the same, at Rs. 3500. Since her vegetarian menu came first, we dug in, shamelessly. 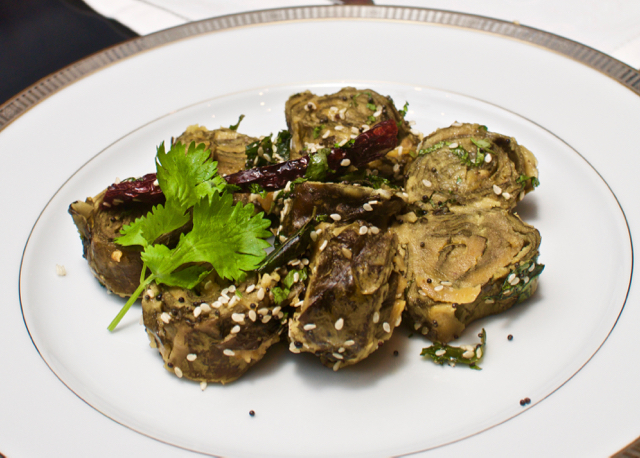 The puris and the dhoklas were great, but the Patra, a leaf with gram flour steamed and served with Fenugreek seeds was a wonderful start. The soft leaves with a slightly sweetish gram filling complimented by the seeds and chilly presented a sweet and spicy flavour. 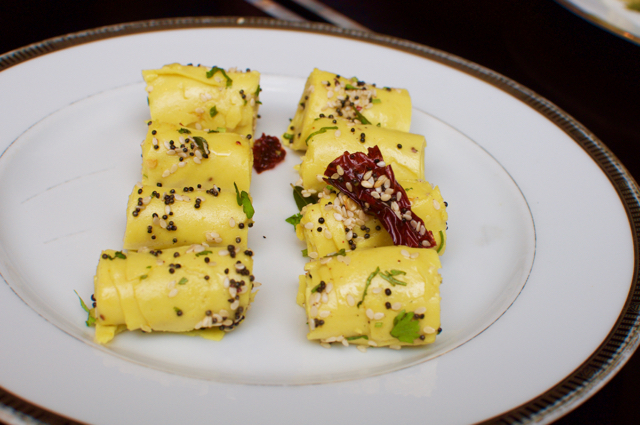 Of course, there has to be Khandvi, a savoury snack made of gram flour and tossed with sesame seeds. Being bite sized and literally melt in the mouth, this snack made for a great starter. 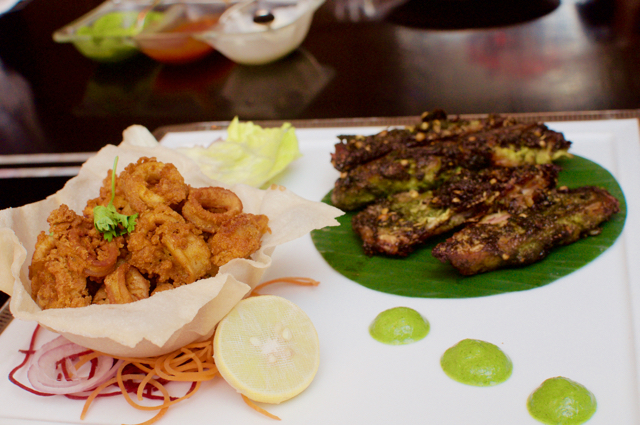 The set menu has four non veg dishes and for me one dish stood out. Like really stood out. The lamb masur, a wonderful home style dish with spiced lamb mince custard topped with saffron. 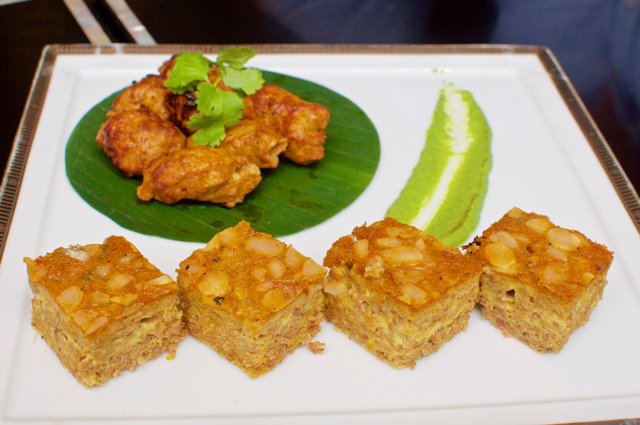 The cake like consistency of the dish along with the really home like flavours made it a very comforting starter. Main courses were a variety of gravies and breads. The Khadi is the Gujju equivalent of our South Indian 'mor kozhambu,' but I think the cumin seeds added the element of sweetness to it, but it was a nice and lovely start to the main course. The sweet and sour Dhal was the other staple that was there in both veg and non veg menus. 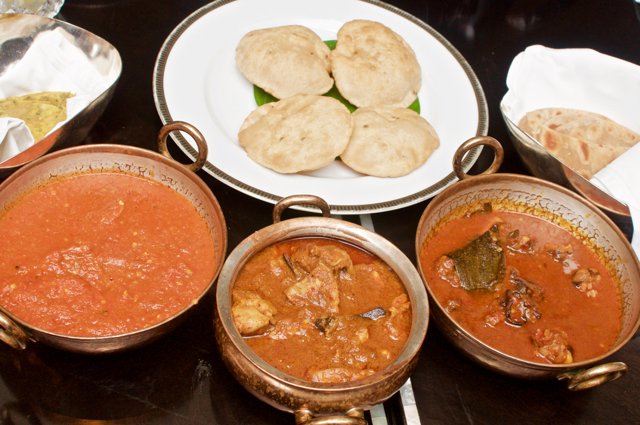 The Paya Curry was best of the non veg main courses. A typical flavour of paya, but in a red gravy was intriguing as I would have expected the tomatoes to have tempered down the flavour of a typical paya, but that wasn't the case. 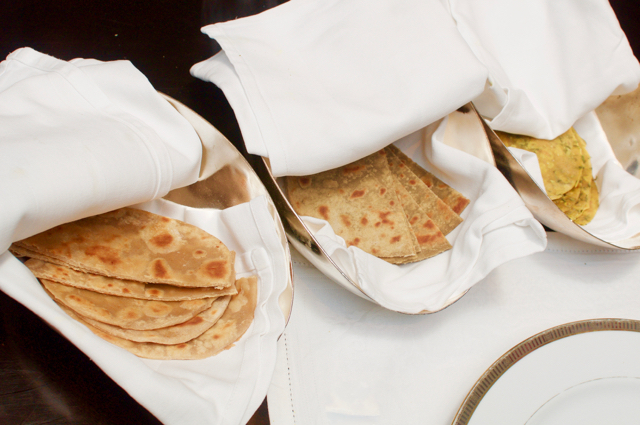 The breads were excellent, with puris and theplas and the likes. There was an excellent khichadi which I will struggle to describe, but imagine it as your usual khichadi but just loads of extra flavour. Desserts were brilliant to say the least, so it was a fitting finish to a rich meal. The badam halwa had a nice smoky flavour and a dark tinge unlike the usual orange or yellow halwas. The smokiness along with the extraordinary rich concentration of almond flavour made it a rich and yummy dessert. 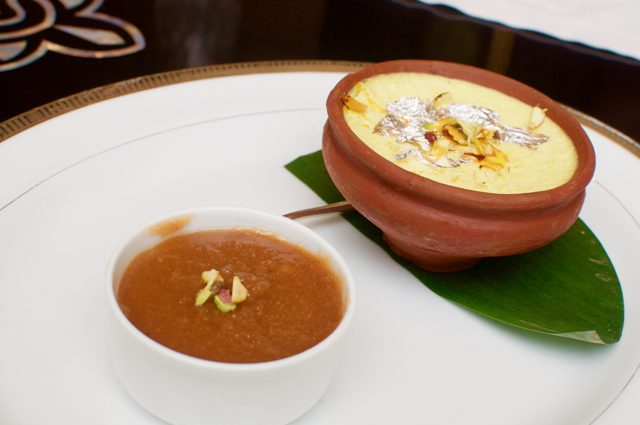 The creamy phirni was an excellent folly to the rich and thick almond halwa, which was equally rich with its strong saffron and cardamom flavours, but still creamy enough to wash down the whole meal. OK, as for the myths busted, I guess the sugar in everything wasn't really busted and there was a tinge of sweetness to most dishes! My bad. The festival is on till the 13th of Feb, 2017.